The project was definitely not for the impatient, perfectionistic, or those who give up easily. Trying to dye a group of differently-colored objects a single final color is tricky. A very close approximation of color for all items is possible with patience and multiple steps. However, I was able to get the batch close enough in color to satisfy me and my daughters. In case you didn't know this about me, I have a bit of a perfectionistic streak in my disposition. So, when everything is not easy-peasy, or a project does not turn out exactly as I had planned, it takes a while for me to shake that "failure" feeling. 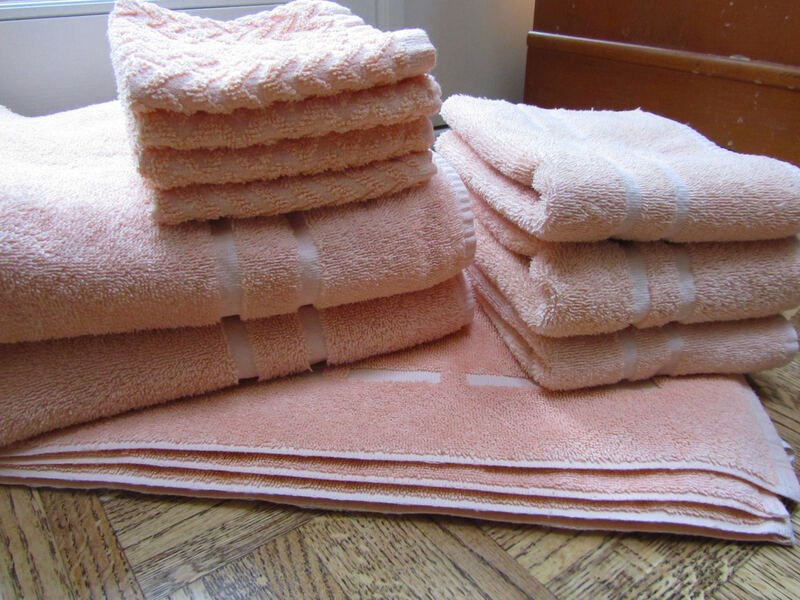 It doesn't make any sense to me, as I can look at the towels and think they turned out beautifully, but my mind remembers the missteps along the road to get to the final outcome. Now, after a little time to relax, I can see that they turned out nicely. The bathmat is just a tad more intense in color than the towels, and the washcloths are slightly more peach than the rest of the batch. Despite this, the group looks great in the bathroom. Old towels, new life. Final cost for a "new" set of bath linens -- $3.74, including sales tax (I forgot to add in tax in yesterday's post). I don't think that you can't buy a single bath towel at Target for that price. The set looks beautiful. Nice job! Did you use Rit dye, or something else? I used Rit dye (the boxed kind) and some leftover tie dye from last summer's t-shirts. The one thing I don't like about the powdered dye is you sometimes get color flakes that attach to fabrics, even when you think you've let the product completely dissolve. For future projects, when even color is important, I think I'll buy the liquid dye. All this said, I'm happy with the results on the towel set. They look great and what a savings. What I can't believe is what good shape they are in for 15 year old towels. I would think they would be thinning and unraveling after being used for that long. (Of course, they can be rehemmed.) They must have been great quality to begin with. The towels are in pretty good shape, likely because these have been extra towels, used occasionally. But I agree, they must have been pretty good quality to begin (I don't know for sure as they were hand-me-downs, and my mother-in-law always cut labels off of items and clothing). As is often said, buying quality is a good investment. Great job! Perfectionism has a place, but you need to know when "good enough" is the right thing to go for. Something I struggle with! Yea, perfectionism is one of those traits that I need to let go of. It can make me crazy at times, and I don't think it is what God intended for us. Thanks on the towels! I like the way they turned out.